April is a popular time to visit Spain, and Madrid in particular draws large crowds throughout the month. If you want to avoid the long processions that characterize Semana Santa, Madrid is a good place to visit, as the city is not famous for its Easter celebrations. On the other hand, if you do want to experience Semana Santa in Toledo, the Spanish capital is an ideal place to stay as Toledo is a convenient day trip from Madrid. But what kind of weather can you expect? Does Madrid fall foul of April showers? Most websites will give you averages, but weather is rarely average. Keep in mind that if it has ever rained on a day, the average rain for that day will be some rain. Plus, average temperatures don't tell you about the freak highs and lows you can expect. April weather can be quite wishy-washy—not just in Madrid, but throughout Spain. While springtime sunshine and warmth are plentiful, rain showers do happen, and so do unexpected cold fronts. Keep these tips in mind so you can pack according to the weather. Temperatures in Madrid vary greatly towards the start of the month, and anything from 50 to 77°F is not uncommon. Bring clothes that can easily be layered, as temperature fluctuations are especially common throughout the day (you might be freezing when you head out in the morning, but warm enough to shed your jacket by afternoon). Mid-April sees things starting to warm up, with averages in the low 70s Fahrenheit. However, it can still be quite cool at times, especially at night. If you plan on experiencing Madrid's iconic nightlife, plan your outfit accordingly. Not much changes between mid- and late April. Temperatures remain relatively stable in the low 70s Fahrenheit near the end of the month as well. Overall, the average high temperature for Madrid in April is 63 degrees Fahrenheit, and the average low is 41 degrees Fahrenheit. If this seems a bit lower than expected, keep in mind the wildly fluctuating temperatures that are especially common at the beginning of the month. As far as rain goes, April is one of the wettest months in Madrid, rivaled only by November and December. The Spanish capital sees an average of 10 rainy days in April, and an average rainfall of about 2 inches. As you can see, the total rainfall isn't that much, despite a full third of the month seeing rainy days. That's because while it obviously does rain quite a bit in April in Madrid, the showers tend to come in short bursts, and massive downpours are uncommon. Take an umbrella with you so you're not caught off guard, but the rain likely won't be bad enough to ruin your sightseeing plans. Instead, plan on plenty of that famous Spanish sun for the most part. Other than an umbrella, there are a few other things you'll want to bring along on your springtime visit to the Spanish capital. As far as clothing goes, think layers. Due to the widely varying temperatures from morning to night, it's a good idea to layer on several items that you can put on and take off throughout the day as needed. Here in Madrid, as well as throughout Spain, locals usually dress according to the season, rather than the weather. That means that even if temperatures get up into the high 70s (as has happened in the past), you'll likely still see madrileños decked out in light jackets and long pants. It's still springtime, after all. Keep this unofficial dress code in mind if you want to look like a local. For accessories, you can't go wrong with a chic pair of sunglasses. As things start to warm up, sunshine is plentiful, and you'll want to protect your eyes from the fierce rays. Madrid or Barcelona: Which Has Better Weather in April? The weather in April in Barcelona is a little cooler than in Madrid and tends to be wetter in Catalonia than in the capital. But with April weather so unpredictable throughout the country, it all comes down to luck as far as weather goes. 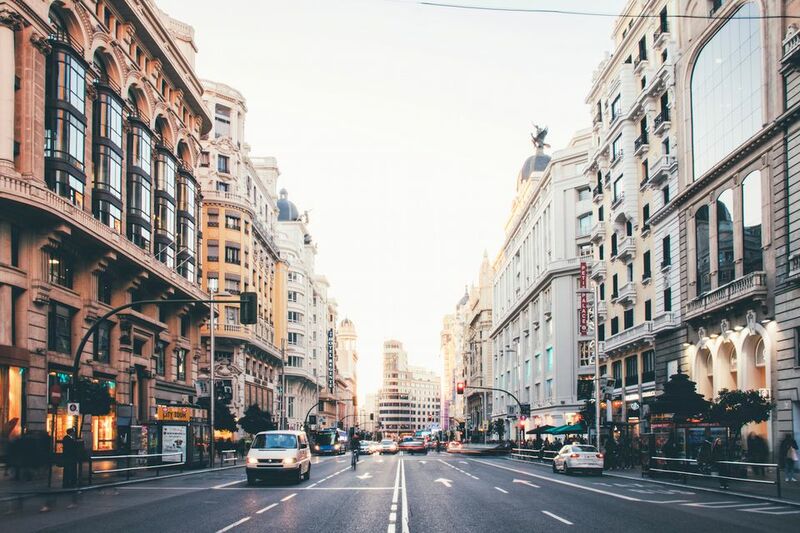 If you're still not sure that visiting Madrid in April is right for you, check out our full guide to planning the perfect trip to Madrid. You'll get a season-by-season overview of events and weather, so you'll know what to expect no matter when you go.